One of the two most unusual features by Jean-Pierre Melville (the other one being the incredible The Silence of the Sea (1949), also set during the German occupation of France), The Forgiven Sinner (1961), is also one of the director’s many fine films. Ingeniously mixing the flamboyance of the then nascent Nouvelle Vague, through its casting, (partial) location shoot and non-classical cutting, and the revered tradition of the European art cinema and the studio cinema of the United States, in its classical staging, expressionist lighting and production design, understated performances and non-modernist literalism, Melville, perhaps inadvertently, plays with the audience’s perception of his film. 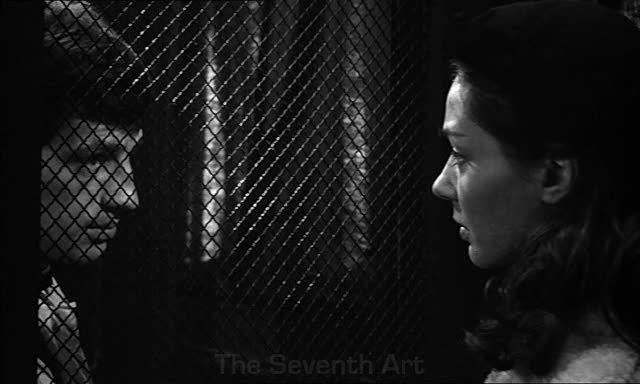 The Forgiven Sinner is set in a little town in France, towards the end of the Second World War, and tells the tale of pastor Léon Morin (Jean-Paul Belmondo, whose New Wave image is cleverly subverted here), who indirectly participates in the French resistance by sheltering Jews, and a Communist woman Barny (Emmanuelle Riva) who seems to be attracted to him. What begins as a series of witty conversations between a reasonable theist and a staunch atheist gets complexly interwoven with the politics of France at large as the characters equate, in both metaphorical and concrete senses, conscious resistance to physical temptation with resistance to imperial occupation and the guilt of desire with the guilt of collaboration. Melville’s direction, however, remains non-judgmental and brilliantly keeps remarking, through a spectacular interplay of avant-garde editing and meticulous mise en scène, the ironies underlying the characters and their situations and how, in fact, Léon and Barny are both on the wrong sides. This is one of your ellipses? Surely a film as complex in your description as this deserves more? Oh, Yes! It deserves much more. But this section is specially built to pamper my laziness. Any other day, I would have put up a larger post. But anyway, let this just remain a mere appetizer for people who want to see the film! Indeed JAFB. Terrific word economy in consideration of this fascinating theological study by Melville that you rightly compare with the even more brilliant LA SILENCE DE LA MER. But what you say there about the expressionistic lighting (this film is superbly lensed by Henri Ducae)classical staging and non-modernist lighting is superlatively-posed,and like LA SILENCE, it’s one of the first (and best) films to deal with Nazi-occupied France. Jean-Paul Belmondo contibutes an outstanding performance as did Montgomery Clift in Hitchcock’s I CONFESS, a film that is some ways is comparable with Melville’s film, though Hitch’s work is ultimately about conscience and the Catholic faith’s issue of sworn secrecy, whereas Melville’s film of course is largely about guilt, as you superbly delineate. All serious Melville fans owe it to themselves to see both this film and LA SILENCE. Thanks Sam. Even I prefer La Silence de la Mer. Not to say that this one’s weaker, but the economy and pathos of that film, not to mention that the film came just 4 years after the war, is something to behold.